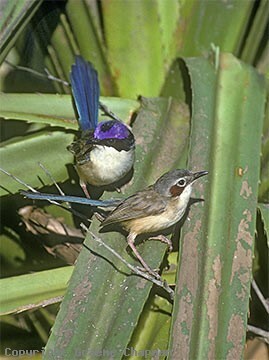 Purple-crowned Fairy-wrens are restricted to tropical northern Australia where they inhabit vegetation fringing watercourses. There are two separate populations - a western one that is confined to certain rivers in the Kimberley Division of W.A. and the Victoria River in the N.T. and an eastern one that ranges between the Roper River in the N.T. across to the Flinders River in north-west Queensland. 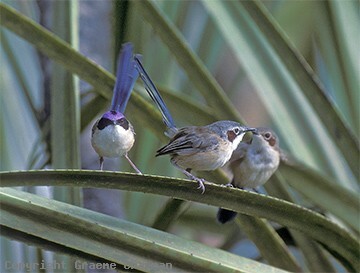 Purple-crowned Fairy-wrens are not your ordinary everyday fairy-wren, they differ from all the others in various ways. Not only are they quite distinctive in appearance, their song is quite different - of lower frequency, quite loud and usually sung as a duet. Their nests are quite large for a fairy-wren, averaging 15.6 cm in height x 10 cm in diameter. Males can take up to three years to attain full adult breeding plumage. They live in much smaller families, often only as an adult pair and average group size is only three - they live permanently in long narrow territories amongst quite specific vegetation mainly along the edges of watercourses. This specific vegetation falls into two categories. In W.A. the usual habitat is Pandanus (P. aquaticus) see pic 542206, except on the upper Fitzroy River at Geike Gorge where the birds inhabit coarse riverside grass known locally as Cane Grass. Further east along the Victoria River in the N.T., other coarse grasses known as Cane Grass and River Grass are used. In this area they also occur in dense grass up to 100 metres from the river as well as thick weedy growth. The eastern subspecies (in N.T. and Qld.) is normally found only in Pandanus. Here the birds rarely move more then 20 or 30 metres away from the water's edge into more open grassy and shrubby places but in the wet season when brief flooding occasionally inundates the lower vegetation, they may have to resort to the trees overhead, either paperbark or eucalypts. The main breeding season is July - Sept with a smaller peak after the wet in March so for those hoping to see a male in his superb full breeding plumage, go looking in June - August. Even then, like many other fairy-wrens, some males do breed in immature plumage, so you may have to look in several territories. Immature males have a partially coloured purple cap (see pic 542217) and are nowhere near as impressive. In non-breeding plumage males moult into a plumage resembling females only with blackish ear coverts. 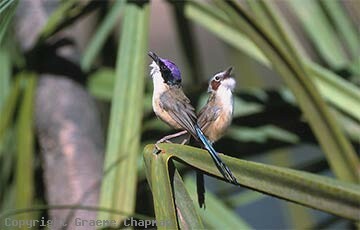 542010 ... Purple-crowned Fairy-wrens, singing in duet. 542202 ... Purple-crowned Fairy-wrens, male and female, Drysdale River, W.A. 542203 ... 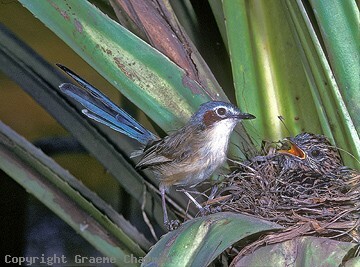 Female at nest in Pandanus with young Brush Cuckoo. 542204 ... Purple-crowned Fairy-wren families are small, averaging approx. three.